‘Gael’s Vision 40th Anniversary Edition’, comprising studio album, full length live DVD and 16pp insert, is now due for release on 29th September. 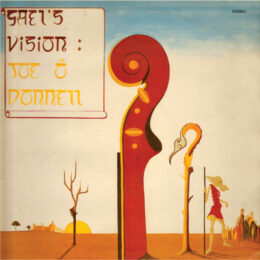 The fully re-worked and enhanced 40th anniversary Edition sees the original 1977 studio album ‘Gaodhal’s Vision’ (different spelling, same pronunciation) remixed from the original 2″ master tapes. There are extra passages from the original recording sessions, including previously unheard guitar solos by Rory Gallagher. Members of Shkayla and others contribute additional instruments as well. The whole piece has been remastered too, giving it a sound much more in tune with today’s technology and taste. Following discussions in the industry we are pleased to announce a lower price point for the package of just £15.00. We hope this will make it attractive to a wider audience. Even better, we are still offering a pre-order discount of 10% off the list price, for a limited period. Check details here. The album officially launches at the prestigious Cork Folk Festival on October 1st, at Cypress Avenue. The day before, Joe will be giving a talk about his times with Rory Gallagher, at the Rory Gallagher Music Library (at 3.30pm if you are in town – all welcome). For fans and the curious closer to home we are pleased to invite you to Leamington’s Zephyr Lounge on September 24th. Here you can enjoy an ‘in yer face’ rendition of the album by the band untrammelled by additional musicians or dancers. It’s a great opportunity to ‘try before you buy’ the album of course!